File photo The 23rd Air Force Marathon is scheduled for Saturday, Sept. 21, 2019. The event will also feature a Sports and Fitness Expo at Wright State University’s Nutter Center scheduled for Thursday, Sept. 19 and Friday, Sept. 20 plus a Breakfast of Champions and Gourmet Pasta dinner scheduled for Friday, Sept. 20. For more information go to www.usafmarathon.com. WRIGHT-PATTERSON AIR FORCE BASE — The Air Force Marathon staff recently honored some of the 2,400 volunteers who made the 2018 race a success during a reception held at Soin Medical Center in Beavercreek. Col. Thomas Sherman, 88th Air Base Wing and Installation commander and Chief Master Sgt. Stephen Arbona, 88 ABW command chief, made the presentations of award categories honoring volunteers, including the annual prize for Best Hydration Station. This year’s winner Best Hydration Station was Beavercreek High School Air Force Junior Reserve Officer Training Corps who manned a station on San Antonio Avenue. on the half marathon course serving over 3,500 runners. This is the group’s first year operating a hydration station. The marathon staff also recognized the Course Entertainer of the Year, also selected by the runners as part of the post-race survey. That honor went to the rock band Forces of Nature who have manned a position outside of Gate 15B, performing for full and half marathoners alike, for more than a decade. This is the band’s third win in a row. The program also honored volunteers for varying levels of service including 23 volunteers who had volunteered all 22 years of the marathon’s existence. Lastly, the staff handed out hardware for volunteer of the year awards in several categories, recognizing individual contributions for the 2018 race. The reception, sponsored by Soin Medical Center, featured heavy hors d’oeuvres and special presentations highlighting volunteer contributions to the 2018 event. Previously, Soin hosted a volunteer lounge at the 2018 Sports and Fitness Expo, a volunteer hospitality tent on race day, and, for the first time, provided all medical support for the event. 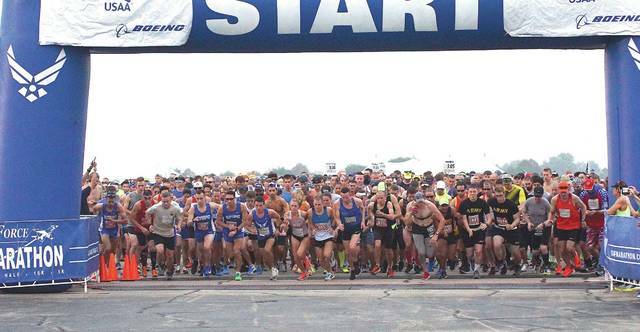 The 23rd Air Force Marathon is scheduled for Saturday, Sept. 21, 2019. The event will also feature a Sports and Fitness Expo at Wright State University’s Nutter Center scheduled for Thursday, September 19 and Friday September 20 plus a Breakfast of Champions and Gourmet Pasta dinner scheduled for Friday, September 20. For more information go to www.usafmarathon.com. https://www.xeniagazette.com/wp-content/uploads/sites/32/2018/11/web1_afmara20182.jpgFile photo The 23rd Air Force Marathon is scheduled for Saturday, Sept. 21, 2019. The event will also feature a Sports and Fitness Expo at Wright State University’s Nutter Center scheduled for Thursday, Sept. 19 and Friday, Sept. 20 plus a Breakfast of Champions and Gourmet Pasta dinner scheduled for Friday, Sept. 20. For more information go to www.usafmarathon.com.